This article is about the Canadian bank. For its subsidiary in the United States, see BMO Harris Bank. The Bank of Montreal, doing business as BMO Financial Group, is a Canadian multinational investment bank and financial services company headquartered in Toronto, Ontario, Canada. One of the Big Five banks in Canada, it is the fourth-largest bank in Canada by market capitalization and assets, as well as one of the ten largest banks in North America. It is commonly known by its acronym BMO (pronounced /ˈbiːmoʊ/), which is also its stock symbol on both the Toronto Stock Exchange and the New York Stock Exchange. On June 23, 1817, John Richardson and eight merchants signed the Articles of Association to establish the Bank of Montreal in a rented house in Montreal, Quebec. The bank officially began conducting business on November 3, 1817, making it Canada's oldest bank. BMO's Institution Number (or bank number) is 001. In Canada, the bank operates as BMO Bank of Montreal and has more than 900 branches, serving over seven million customers. The company also has substantial operations in the Chicago area and elsewhere in the United States, where it operates as BMO Harris Bank. BMO Capital Markets is BMO's investment and corporate banking division, while the wealth management division is branded as BMO Nesbitt Burns. The company is ranked at number 131 on the Forbes Global 2000 list. The Bank of Montreal was founded in 1817 as the first bank in Canada. The Bank of Montreal established branches in Newfoundland on January 31, 1895, following the collapse of the Newfoundland Commercial Bank and Union Bank of Newfoundland on December 10, 1894. 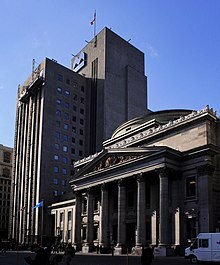 In 1925, Bank of Montreal merged with the Molson Bank. BMO's operational head office moved to First Canadian Place on Bay Street in Toronto in 1977, while its legal headquarters remains at the historic Montreal structure it has occupied since 1847. Bank of Montreal, like the other Canadian chartered banks, issued its own paper money from 1817 until 1942. Though the last notes were issued during that year, they may have circulated for some time after. In 1944, the Bank of Canada (est. 1934) became the sole issuer of currency in Canada, and notes from private banks were withdrawn. Today, the Bank of Montreal commonly goes by the brand name BMO. It is a major international bank with subsidiaries operating in the United States and other countries around the world. BMO and Simplii Financial (a subsidiary of the Canadian Imperial Bank of Commerce) were the targets of hackers in May 2018, who claimed to have compromised the systems of both banks and stolen information on a combined 90,000 customers (50,000 from BMO). An email sent from a Russian address and attributed to the hackers demanded a ransom of US$1 million from each company paid via Ripple by 11:59 pm on May 28, 2018 or the information would be released on "fraud forum [sic] and fraud community [sic]." Bank of Montreal's main Montreal branch at Place d'Armes in Montreal. Taylor also designed a three-storey structure for the Bank of Montreal on Saint Jacques Street in Montreal in 1818. The building was modelled after a Georgian townhouse with a small portico of Corinthian columns supporting a classical pediment and remains the bank's legal headquarters. The Bank of Montreal's operational head office is located at First Canadian Place in Toronto, designed by Edward Durrell Stone. The Bank of Montreal, Front & Yonge Streets, Toronto, Ontario (closed). The 1885 Beaux-Arts styled building designed by the Toronto firm of Darling & Curry has been the site of the Hockey Hall of Fame since 1993. Merchants Bank of Canada (1922), as well as several investment banking firms. George Garden (c.1772–1828), director from 1817 to 1826 and vice-president from 1818 to 1822. President was the highest-ranking position at the bank from its founding until the middle of the twentieth century, however this was superseded by chief executive officer in 1959, beginning with G. Arnold Hart. Several of his successors as President were CEO as well, however Matthew W. Barrett was the first top executive not to be styled president. Since the middle of the twentieth century, the senior officer of Bank of Montreal has been styled President and chief executive officer beginning with G. Arnold Hart. That officer often also held the title chairman of the board, until 2003 when a non-executive chairman was appointed. The title of the second-ranking executive has changed several times and has often been left vacant. As deputy to Matthew Barrett, F. Anthony Comper was President and chief operating officer from 1990 to 1999, after which he became chairman and CEO while retaining the title of President. During most of Anthony Comper's tenure as CEO, while there was no official "number two" executive, the CEO of BMO Capital Markets (the investment banking division) was largely considered the second-most powerful officer. Bill Downe ascended from CEO of BMO Capital to chief operating officer of the BMO group, but held the title only for one-year until he succeeded Comper as President and CEO in 2007. BMO is divided into three "client groups" which serve different markets. Each of the client groups operates under multiple brand names. BMO Private Banking (private banking in Canada and the United States) including Harris myCFO and Cedar Street Advisors (both affiliates of BMO Harris Bank) In 2014–2015 BMO rebranded BMO Harris Private Bank as BMO Private Bank. In October 2008, Mediacorp Canada Inc. named BMO Financial Group one of Greater Toronto's Top Employers. Current members of the board of directors of BMO are: Robert Astley, David R. Beatty, Robert Chevrier, George Cope, Bill Downe, Christine A. Edwards, Ronald Farmer, David A. Galloway, Harold Kvisle, Eva L. Kwok, Bruce H. Mitchell, Philip Orsino, Martha C. Piper, Robert Prichard, Jeremy Reitman, Guylaine Saucier, Don M. Wilson III, and Nancy Southern. BMO's official legal corporate head office is in Montreal, located on Saint Jacques Street. The chairman, President and some senior division executives work in the Toronto offices at First Canadian Place. From at least 2007 through 2011, BMO was a sponsor for the Toronto Maple Leafs. It has been a sponsor of the Toronto FC of Major League Soccer since 2007 and of its home arena named BMO Field at Exhibition Place. and the Toronto Raptors. In 2010, BMO extended its agreement with the Toronto FC through the 2016 season. In 2005, BMO Bank of Montreal became the title sponsor for the annual May marathon race staged by the Vancouver International Marathon Society. The current name is "BMO Bank of Montreal Vancouver Marathon". Since 1997, Bank of Montreal has been a major sponsor of Skate Canada, and is the title sponsor of the BMO Financial Group Canadian Championships, BMO Financial Group Skate Canada Junior Nationals, BMO Financial Group Skate Canada Challenges, BMO Financial Group Skate Canada Sectionals, and BMO Financial Group Skate Canada Synchronized Championships. It is also the presenting sponsor of the CanSkate Learn-to-Skate Program. On July 23, 2008, BMO announced it signed a one-race deal with IndyCar team Newman/Haas/Lanigan Racing to appear on the No. 06 car of Graham Rahal in the first-ever IRL-sanctioned Canadian IndyCar race at Edmonton. On June 14, 2011, the Montreal Impact announced a five-year agreement with the Bank of Montreal (BMO) to become lead sponsor and jersey sponsor when it became an MLS expansion team in 2012. BMO is a founder and major sponsor of the Siminovitch Prize in Theatre, an annual award of $100,000 granted to a Canadian director, playwright, or designer. In 1984, the bank greatly expanded its operations in the United States through the purchase of Chicago's Harris Bank. Harris, rebranded BMO Harris Bank in 2011, has continued to expand additional acquisitions. In 1998, Bank of Montreal shocked the Canadian financial community and public by announcing plans to merge with RBC. Government regulators later blocked the proposed merger, along with a similar proposal by the Toronto-Dominion Bank to merge with the Canadian Imperial Bank of Commerce. In December 2000, the banks were successful in merging their credit and debit card processing services to form Moneris Solutions. In 2006, BMO bought BCPBank, a Schedule C financial institution that was the Canadian division of Banco Comercial Português, with eight branches in the Toronto-West area. BMO bought Griffin, Kubik, Stephans, and Thompson (GKST) in 2008, a Chicago-based firm that specializes in municipal bonds, U.S. Treasury and agency debt, and mortgage-backed securities with approximately 100 employees handling sales, trading, research, public finance and underwriting. In 2009, BMO purchased AIG's Canadian life insurance business, AIG Life Insurance Company of Canada, for approximately $330 million CAD. The transaction, including 400,000 customers and 300 employees, made BMO the second-biggest life insurer among Canadian banks. The new component was renamed BMO Life Assurance Company. In November 2009, Bank of Montreal announced the purchase of Diners Club International's North American franchise from Citibank. The transaction gave BMO exclusive rights to issue Diners cards in the U.S. and Canada. The deal closed in December 2009. In December 2010, BMO announced the purchase of Milwaukee-based Marshall & Ilsley Corporation, which operated as M&I Bank. Prior to acquisition, M&I was Wisconsin's largest and oldest bank, with branches in Wisconsin, Minnesota, Missouri, Kansas, Arizona and the Indianapolis market. When the transaction completed, M&I Bank, along with current Harris Bank branches were rebranded BMO Harris Bank. In January 2011, BMO announced the purchase of Hong Kong-based Lloyd George Management. Lloyd George has offices in Hong Kong, London (UK), Singapore, Mumbai and Florida and manages a portfolio of approximately US$6 billion. In September 2015, BMO agreed to acquire General Electric Co. subsidiary GE Capital's transportation-finance unit. The business acquired has USD $8.7-billion (CAD $11.5-billion) of assets, 600 employees and 15 offices in the U.S. and Canada. Exact terms were not disclosed but the final price would be based on the value of the assets at closing plus a premium according to the parties. In June 2016, BMO agreed to acquire Greene Holcomb Fisher, a Minneapolis investment bank. Greene Holcomb Fisher also has offices in Seattle and Atlanta. The terms of the acquisition were not released. Rating agency Moody's Investors Service began to review the long-term ratings of the Bank of Montreal and other Canadian banks because of concerns about consumer debt levels, housing prices, and a sizable exposure to capital markets in October 2012. In January 2013, the service announced downgrades for Bank of Montreal and five others. Wikimedia Commons has media related to Bank of Montreal. ^ a b c "BMO Income Statement - Bank Of Montreal Stock - Yahoo Finance". finance.yahoo.com. ^ "BMO Profile - Bank Of Montreal Stock - Yahoo Finance". finance.yahoo.com. ^ Tor, Maria; Sarfraz, Tor (23 December 2013). "World's 100 Biggest Banks: China's ICBC #1, No U.S. Banks In Top 5". Forbes. SNL Financial. Retrieved 2014-05-08. ^ Bonham, Mark S. (2012). "Bank of Montreal". The Canadian Encyclopedia. Thecanadianencyclopedia.com. Retrieved 2013-03-18. ^ "Branch Banking". bmo.com. Retrieved 2013-03-18. ^ "The Global 2000". Forbes. forbes.com. 2013. Retrieved 2013-11-10. ^ Blackwell, Richard (November 25, 2008). "The Explainer: Are bank dividends safe from cuts?". The Globe and Mail. Archived from the original on December 4, 2008. Retrieved May 31, 2018. The big banks have an astonishingly long record of consistently paying dividends. Bank of Montreal has been distributing them non-stop since 1829 - almost 180 years, the longest unbroken record of any Canadian company. Bank of Nova Scotia's streak goes back to 1833, TD's to 1857, CIBC's to 1868 and Royal's to 1870. ^ Bélanger, Claude (January 2005). "Bank of Montreal". Marianopolis College. Retrieved 2013-03-18. ^ Pound, Richard W. (2005). Fitzhenry and Whiteside Book of Canadian Facts and Dates. Fitzhenry and Whiteside. ISBN 978-1550411713. ^ "Bank of Canada Act" (PDF). Bank of Canada. 8 October 2008. p. 30, section 25. Retrieved 2013-03-18. ^ Ligaya, Armina (May 28, 2018). "BMO and CIBC's Simplii says fraudsters may have accessed clients' information". Toronto Star. The Canadian Press. Retrieved May 29, 2018. ^ "Hackers threaten to reveal personal data of 90,000 Canadians caught in bank hack". CBC News. May 29, 2018. Retrieved May 29, 2018. ^ "Bank of Montreal (Delta, BC)". Historicplaces.ca. Retrieved 2013-03-18. ^ "Bank of Montreal (New Westminster, BC)". Historicplaces.ca. Retrieved 2013-03-18. ^ "Bank of Montreal (Corner Brook, NL)". Historicplaces.ca. Retrieved 2013-03-18. ^ "Bank of Montreal (Winnipeg, MB)". Historicplaces.ca. Retrieved 2013-03-18. ^ "The Bank of Montreal Building (Amherst, NS)". Historicplaces.ca. 19 January 1981. Retrieved 2013-03-18. ^ "Bank of Montreal (Hamilton, ON)". Historicplaces.ca. Retrieved 2013-03-18. ^ "Bank of Montreal (Ottawa, ON)". Historicplaces.ca. Retrieved 2013-03-18. ^ "Bank of Montreal". Historicplaces.ca. Retrieved 2013-03-18. ^ Harold D. Kalman (1906-04-17). "Bank Architecture". Thecanadianencyclopedia.com. Retrieved 2011-02-19. ^ "Bank of Montreal, BCE Place". Spencer R. Higgins, Architect Incorporated. Retrieved 2014-05-08. ^ The centenary of the Bank of Montreal, 1817–1917. Bank of Montreal. 1917. p. 8. Retrieved 2013-03-18. ^ a b Martin, Joseph E. (2017). "Titans". Canada's History. 97 (5): 47–53. ISSN 1920-9894. ^ Richard Yerema and Kristina Leung (9 October 2012). "Reasons for Selection, 2009 Greater Toronto's Top Employers Competition". Eluta.ca. Retrieved 2013-03-18. ^ "Coast to Coast: Toronto". Sports Business Journal. sportsbusinessdaily.com. 2 April 2007. Retrieved 2013-03-18. ^ Matsumoto, Rick (23 March 2007). "FC banks on jersey logo". Toronto Star. thestar.com. Retrieved 2013-03-18. ^ "BMO Field to be Home for Toronto FC and Canada's National Soccer Teams" (Press release). BMO Financial Group. 20 September 2006. Archived from the original on 26 October 2012. Retrieved 2013-03-18. ^ "BMO Renews Toronto FC Jersey Sponsorship" (Press release). marketwire.com. 5 July 2010. Retrieved 2013-03-18. ^ "BMO Bank of Montreal Takes the Lead, Becoming the Title Sponsor of the Vancouver Marathon" (Press release). BMO Financial Group. 20 December 2005. Archived from the original on 5 March 2016. Retrieved 2013-03-18. ^ "2010 BMO Canadian Figure Skating Championships Begin in London, Ontario" (Press release). BMO Financial Group. 10 January 2010. Archived from the original on 2016-03-04. Retrieved 2013-03-18. ^ "Wheels & Deals: Tony Stewart To Announce Number, Sponsors". Sports Business Journal. sportsbusinessdaily.com. 23 July 2008. Retrieved 2013-03-18. ^ "Impact Sign Five-Year Jersey Sponsorship With BMO For MLS Debut". Sports Business Journal. sportsbusinessdaily.com. 15 June 2011. Retrieved 2013-03-18. ^ "Jury Announced for 2008 Siminovitch Prize in Theatre" (Press release). SiminovitchPrize.com. 20 May 2008. Archived from the original on 11 April 2013. Retrieved 2013-03-18. ^ "About Us". BMO Harris Bank. Retrieved 2013-03-18. ^ "The Competition Bureau's Letter to the Royal Bank and Bank of Montreal". Government of Canada—Competition Bureau. 11 December 1998. Retrieved 2013-03-18. ^ "Our Founding Partners". moneris.com. Retrieved 2013-03-19. ^ "BMO Financial Group to Acquire bcpbank Canada" (Press release). BMO Financial Group. 3 August 2006. Archived from the original on 5 March 2016. Retrieved 2013-03-19. ^ Olver, Lynne (21 April 2008). "UPDATE 1-Bank of Montreal to buy U.S. bond dealer GKST". Reuters. Retrieved 2013-03-19. ^ Callan, Eoin; Sturgeon, Jamie (13 January 2009). "CMO buys AIG's Canadian life insurance unit". Financial Post. financialpost.com. Retrieved 2013-03-18. ^ "BMO Financial to buy Diners Club from Citigroup". Toronto Star. thestar.com. 24 March 2009. Retrieved 2013-03-18. ^ Gores, Paul (17 December 2010). "M&I to be sold to Canadian bank for $4.1 billion". Milwaukee Journal Sentinel. Jsonline.com. Retrieved 2013-03-18. ^ Gores, Paul (6 July 2011). "It's official: M&I is absorbed by Canada's BMO". Milwaukee Journal Sentinel. Retrieved 2013-03-18. ^ French, Cameron (11 January 2011). "UPDATE 2-Bank of Montreal buys Hong Kong's Lloyd George". Reuters.com. Reuters. Retrieved 2013-03-18. ^ "BMO News Release BMO Financial to acquire GE Capital's transportation finance business" (Press release). 10 September 2015. Archived from the original on 26 December 2015. Retrieved 2015-09-16. ^ "BMO buys Minneapolis investment bank Greene Holcomb Fisher". Star Tribune. Retrieved 2016-06-03. ^ "Moody's downgrades 6 Canadian banks". CBC News. cbc.ca. 28 January 2013. Retrieved 2013-03-19.